If you are rolling out your application on Smartphone or Pocket PC phone edition devices, you may wish to record the device’s International Mobile Equipment Identifier (IEMI) or International Mobile Subscriber Identity (IMSI) numbers. These numbers can be used to track what device and SIM card are being used by which user. It can also be used to ensure that the data on the device is kept unique by using the number as a device prefix within your data. 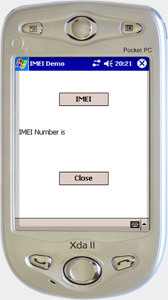 The Sapphire IMEI Utility allows both the IMEI and IMSI numbers to be read from SmartPhone and Windows Mobile devices. Implementation couldn’t be easier, simply declare the DLL function as a function within your application and call it as though you wrote it yourself. Here’s a sample demo to how to retrieve the device’s IMEI number within VB.NET. Developer's Licence cost 199 GBP.